BY LAURA SILVERMAN, Edible Hudson ValleyRuby Duke describes herself as “persistent,” but that’s only one of many traits essential to being a farmer, charcutier,..
Raven & Boar is a family owned farm in Northern Columbia County. Each small herd of pigs are raised with care on open pasture and forest. The pigs are all heritage breeds, mostly Large Black, Gloucester Old Spot and Red Wattle, with some Berkshires, Tamworth, and a few Mulefoot and Herefords. Ruby and Sather Duke founded Raven & Boar in 2009 and are also the principles of hiveminddesign inc., designing and manufacturing furniture and interiors since 2000 (Restaurants: Back Forty West SOHO, Empire Tavern @ JFK, Baked Redhook Bklyn). When they moved their business from Brooklyn to East Chatham in 2008, the Duke's also set the simple goal of raising and growing as much of their own food that they cold on the land surrounding their house and studio. Sather and Ruby are both avid gardeners and cooks and it seemed inevitable that they would strive to have the best tasting pork possible. The next step was making this high quality pork available to a select group of buyers. Raven & Boar partners with the local Coach Farm in Pine Plains (www.coachfarm.com) and other local cheese producers to use the whey from their cheese production as a source of food for our pigs (in the tradition of Italian pig farmers). The pork from pigs fed whey has a unique flavor and texture, is naturally more marbled, and is especially excellent for charcuterie. Hudson Valley Charcuterie's goal is to produce small batch artisanal product lines of charcuterie exclusively from our own pigs raised here on the farm. The kitchen will facilitate our own need to produce custom artisanal Raven & Boar value added products as well as a place where chefs and like-minded individuals can come to make their own product. Production Methods: Raven & Boar’s pigs are fed whey soaked grains, grass, vegetables, fruits and naturally foraged roots and acorns. The pigs are rotated on seasonally managed pasture with grass fed lambs and chickens, which keeps them all healthy and happy while also providing a fertile bed for next year’s garden. All animals are USDA processed and are made available all year round. Where to Find our Products: Raven & Boar meat, fresh free range eggs and seasonal forage, herbs and produce can also be found at the Rhinebeck NY, West Stockbridge MA and Lenox MA farmers’ markets. 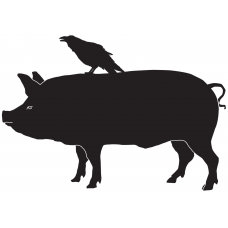 Wholesale Information: Raven & Boar seeks to continue partnerships with local businesses to not only create a delicious product but to provide high quality meat to local residents and restaurants.